Storm chasing vehicle tackles extreme weather in Central U.S.
OKLAHOMA CITY – It looks like something out of a Mad Max movie. But forget the bad guys. This mean-looking machine prowls the highways and back roads of Tornado Alley in search of the biggest, baddest storms. Say hello to the BMFCT. That’s Big Mother Effin’ Chase Truck, doncha know. Michael Ratliff behind the wheel of the BMFCT (photo courtesy Thad Bowling). 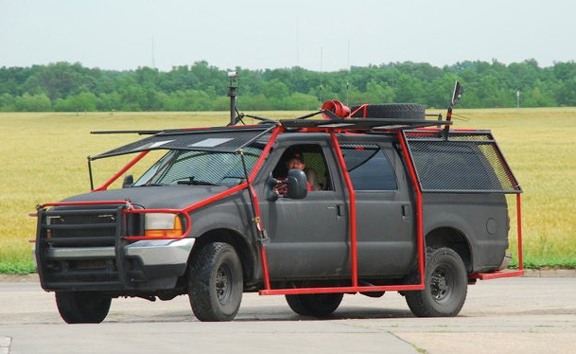 The mega-modified 2000 Ford Excursion is the brainchild of Oklahoma storm chaser Michael Ratliff. The 30 year old is fascinated with tornadoes, and wanted a vehicle that could withstand a close encounter with softball-sized hail and flying debris. But make no mistake. Tornadoes are one of the most destructive natural forces on earth. Any vehicle that’s going to get next to one – and stay there – needs to be heavily fortified. Case in point? The TIV2 (Tornado Intercept Vehicle) and Dominator 2, the armoured vehicles that are featured in the television series “Storm Chasers.” Both have intercepted tornadoes – and survived to drive another day – and are still the most formidable and expensive chase vehicles out there. And then there’s the Excursion. 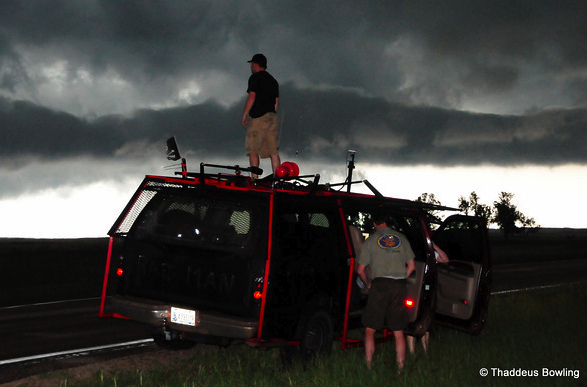 Ratliff bought it last November with the goal of transforming it into his own state-of-the-art storm chasing machine. One that would be a step above the average chase vehicle – which might feature a hail screen for the windshield – but a step below the TIV2 and Dominator. It was the culmination of six months of planning. Oklahoma storm chaser Michael Ratliff. “I would lay in bed every night, piecing it together, dissecting it, changing things up, drawing it out, scratching it out… my brain hurt,” he laughed. With its 6.8 L V10 engine, the Excursion is powerful enough to haul passengers, luggage and equipment at the 130-plus km/h speeds often necessary to catch – or outrun – a tornadic storm. And the four- wheel drive is invaluable for navigating muddy back roads. But this Ford needed to be built tornado tough. Ratliff’s first step was to coat the whole vehicle with a spray-on bed liner called Bullet Liner. After “pestering the crap” out of the product’s manufacturer, Burtin Polymer Laboratories of Georgia, Ratliff finally convinced them to sponsor the BMFCT as a test case and got the job done free. Then it was on to the hail cage. A friend’s father offered to weld together the one and a half inch steel tubing (painted red) that’s bolted to the SUV’s frame and which acts as a mount for the hail shields. Despite its rugged appearance, the steel tubing is not a roll cage. And that engineering is impressive. The hail cage has six panels of expanded metal – one for the windshield, one for the rear window and two along each side. The foremost three contain two squares each of a polycarbonate resin thermoplastic called Lexan – your basic bulletproof glass – which allows Ratliff a clear view of what’s going on when the cage is down. Each shield can be raised and lowered independently by means of 36-volt 18-inch linear actuators. All are controlled remotely from within the vehicle, unlike other chase vehicles where the hail guards have to be moved into place manually. Inside, the BMFCT is outfitted with a laptop computer and separate wide-screen monitor mounted to the centre console. This is where Ratliff accesses up-to-date radar data and weather maps through a mobile Internet connection. He also has a two-meter ham radio, which is the main source of communication among storm chasers and connects to Emergency Management personnel and the National Weather Service. Finishing touches included emergency lighting and a remote- controlled 360-degree camera with night vision mounted on the roof, which Ratliff uses to live stream video of his chases. The roof also sports a red tornado siren, which Ratliff sounds to warn people when a twister is imminent or on the ground. Ratliff did most of the wiring himself, drawing on the expertise gained from his “real” job as an installer of home entertainment systems. All told, he estimates he’s spent $10,000 on materials to build the BMFCT. It would all be put to the test on May 22 in Joplin, Missouri. I was riding shotgun with Ratliff on I-44 when an EF-5 tornado – the most powerful and destructive of all – crossed the interstate about two minutes ahead of us. As the wind and rain buffeted the BMFCT, Ratliff deftly held the four-tonne vehicle steady while communicating by radio with the other vehicles in our storm-chasing group. Moments later, we came across about a dozen tractor trailers scattered across the road like matchsticks. Ratliff pulled to the side immediately, activated his emergency lights and hopped out amid the lightning and crashing thunder to help rescue the drivers. Ratliff brought one of the truckers back to our vehicle and dug into his first aid kit for gauze to apply to a bleeding head wound. We then wove our way through flipped trucks and traffic to the hospital in Joplin – the one that hadn’t been hit by the tornado. 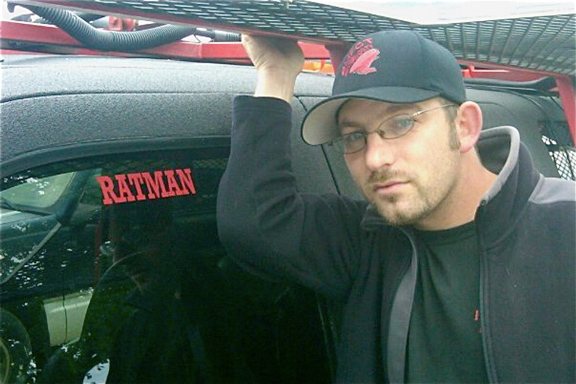 Despite his harrowing experience in Joplin and in other locales during his eight years of storm chasing, Ratliff still dreams of driving the BMFCT straight into a tornado. He’s already got the necessary modifications in mind. In the coming year, Ratliff plans to install a roll cage inside the vehicle. He also wants to add an Air Lift suspension capable of raising the vehicle 15 centimetres for additional clearance, and dropping it 30 centimetres so it hugs the ground. That would lessen the chance of tornadic winds getting under the vehicle and flipping it. Finally, he hopes to skin the entire vehicle with thin metal coated in Bullet Liner as an added layer of protection against a tornado and its associated hail and debris. On the road in Kansas, May 2001 (photo courtesy Thad Bowling). It’s a lot of work – and expense – for a storm season that usually lasts about eight weeks every spring. But Ratliff is passionate about his pursuit. Unlike some of the other chase teams out there, he didn’t build the BMFCT to collect scientific data on storms or film an IMAX movie. But somewhere, Mad Max is giving him a big thumbs up.